Jefferson, and Samuel Adams were all Volunteer firefighters. 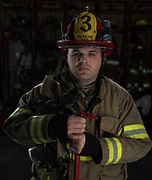 For 85% of the United States today, volunteer firefighters are the first responders. This project is to show the world the faces of their neighbors who sacrifice their lives to protect their community.